While it has been quite a while since the last blog post, that doesn’t mean we haven’t been working on the airplane. Since November we have been working on the aft fuel tanks in both stubwings, fitting the top and bottom wing skins on the starboard stubwing and a lot of details in the cockpit area. This past week we have had some great news regarding the port wing. We have been working with a “little cloud hanging over our heads” for the last six months. We thought that we were going to have to remove and rework the attachment brackets on the port wing. This would have taken several months to perform and presented some serious risks to the wing structure. The great news is that the wing will not require any re-work, our earlier measurements were faulty! Here are two pics of the port wing being fitted to the stubwing. Pilot side (port) wing being test fitted to the “stubwing”. It is a long wing! In late January, we test fitted both wings onto the fuselage and looked at how well they matched each other. The starboard wing was practically perfect but we had some concerns about the port (pilot) side wing. It appeared to have the leading edge lower and the trailing edge too high. Not only would it not fit correctly with the stubwing, but it appeared that the port wing’s angle of incidence would be less than that of the starboard wing. Not a good situation. After much pondering, we decided that we would probably have to remove the top and bottom aluminium mounting brackets from the port wing and add some thin aluminium shims to change the angle slightly. While this sounds simple, it actually would be a complex and difficult job. 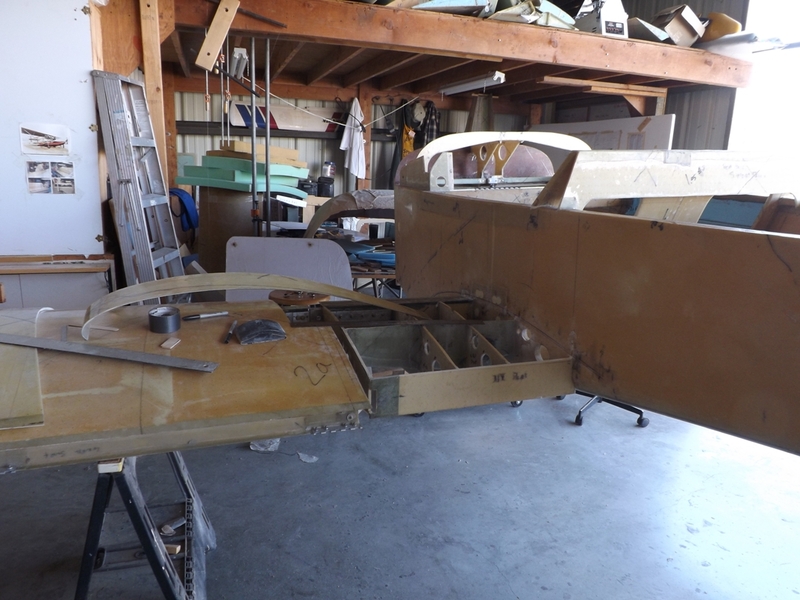 For one thing, separating the aluminium brackets from the wing spar would require removing 20+ bolts and somehow getting the aluminium to “pop off” the floxed surface without damaging the fiberglass wing spar. Then we would need to redrill the bolt holes, shim the brackets and then re-attach the brackets with new oversized bolts. We would also have to cut away some of the wing’s skin in order to get to some of the bolts. If this all went well, the wing’s angle of incidence would be correct and if we were lucky, we wouldn’t damage or weakened the wing. We decided to wait on this fix and work on building the two fuel tanks and fit the skins on the other stubwing (starboard) first. 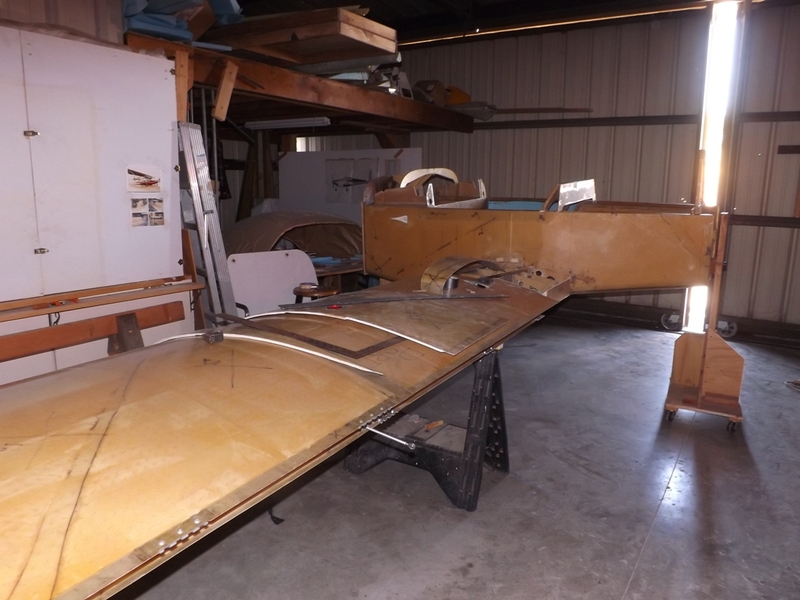 We spent the better part of the last 5 months getting the starbord stub wing built. It is currently about ready to be closed up. Now that we had a pretty good idea of how to build the other stubwing, we decided to re-check how the fit of the port wing. Using a better set up to measure the relative positions of the leading and trailing edges of the stubwings and the port wing, we discovered that the port wing fit much better than we originally thought! The only problem was that the wing is just slightly lower than the starboard wing (like about 0.2″) but the angle of incidence was just fine. This is a huge relief, since it means that we will not have to re-work the port wing’s bracket after all (which would have required about 2 months of work). Now we feel confident that we can go ahead and start fitting the port side stubwing skins.